God’s invitation to me to draw into His company is highly personal. That might read terribly obvious, but honestly, for many years I felt as if my presence before Him was somewhat arbitrary. I felt detached to the degree that it seemed as if someone else could easily stand-in for me and “pray.” Ironically, I talked to God about it consistently. But when the word PRAYER would surface, a whole lot of conceptions about what that was, left me profoundly dulled. I would hear about prayer-meetings or prayer-warriors and feel glad that someone was taking care of that “discipline.” I was occasionally curious that I didn’t seem to have a compulsion to attend them or to be one of them. Busy with other “spiritual disciplines,” I didn’t recognize my growing apathy. Many tentacles had attached to the word prayer, most of which were mis-attached. But then God sparked a whole thought process within me, stemming from my unsettled-ness about how numb I was to the subject of “prayer.” I began to ask the Lord what I didn’t understand. Why was “prayer” something I pursued as a last-resort rather than being my first course of action? I started asking for a word or picture… anything that might help me get this huge thing turned upright. Out of that conversation surfaced the phrase Entering the Dialogue and a picture of four chairs, three of which He occupied and one left open for me. Prayer is dialogue. Simple. But the word entering was and is key for me, because it reminds me that I draw in to His company. I am coming in… to something already taking place. That is a big deal and it puts me in a frame of mind and heart that is essential as I dialogue with God. God asks me, “Anne”, to come to Him. 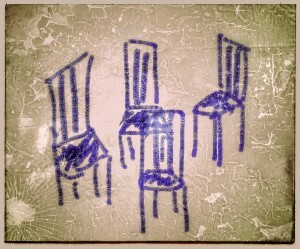 I’m not an arbitrary occupant of the fourth chair. He is asking specifically for me. That brings tremendous import to His invitation. It’s no longer possible to be satisfied that prayer-warriors are praying. I MUST be praying. I must be dialoguing… personally… in conversation with God. No one can take my place. No one can “sub-in” for me. I must be there. It’s where I must live, 24/7, for the rest of my days. Beautifully written, thank you. Had the exact same experience, thoughts and attitudes about prayer until lately when I actually entered His presence just to experience Him. No words necessary, no requests or needs. Just experiencing His glorious magnificence.